In 2016 you committed to helping some of the refugees who arrived at Europe’s doorstep to find a home. To this day, you have relocated only a tiny fraction of the people we are able to host. The situation has become unbearable and requires urgent attention. Follow through with your commitments. Have you ever had to shower outdoors when it’s -8℃? There are currently tens of thousands of people in Greece and in Serbia who know what that’s like. 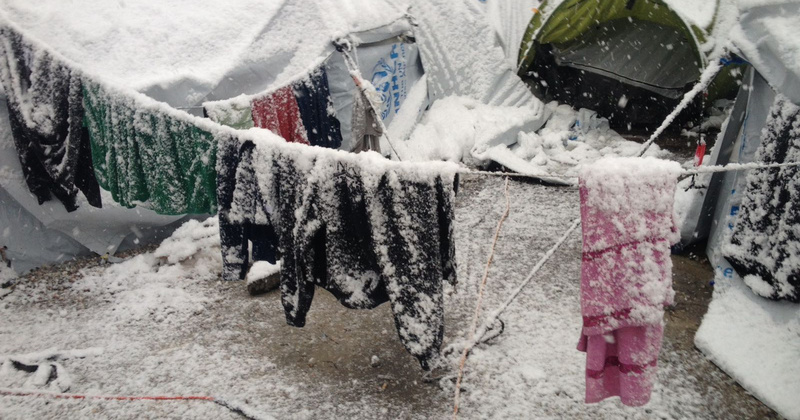 They are braving the coldest winter in four years in makeshift camps (tents, abandoned warehouses) with no heating. They don’t have adequate clothing, some are in flip-flops. They are forgotten, trapped. Over one year ago, our leaders committed to taking in some of the refugees from Greece. They did not follow through, and now thousands are out in the cold. However you may feel about allowing people to come to Europe, one thing is certain -- as Europeans we cannot allow other human beings living in Europe to freeze to death. Emergency talks on how to provide urgent assistance are currently being held at all levels of EU institutions and everyone has a responsibility to do their part. But unless there is clear outrage from the European public, our leaders will not do enough. The WeMove community has already raised over €60,00 to give directly to organisations ensuring the survival of people on the ground, so now is the time to push for a more sustainable solution to this humanitarian emergency. Als Europäerin schäme ich mich für unsere Politiker und verachte sie für ihre Unbarmherzigkeit. .
Really I must say that if you can omly shower outdoors at -8 you should choose not to shower. If any shower fanatical health professionals say otberwise they are obviously wrong about health and abusive. I feel utterly useless. I can not even begin to imagine what it is to be a refugee fleeing for my life. I am ashamed that all countires of the EU have leadrers who are failing to care, help, nurture, support, save. Please, on my behalf - do more. 2017 has gotten off to a bad start when it comes to refugee rights in Europe. And we know our movement will be needed throughout the year to fight for better policies which give dignity to people, rather than criminalise their movements. Most of the campaigns at WeMove could not be run without small regular donations from the community. But if even more people started donating a few euros each week we wouldn't need to worry about backing down from a fight as big as this one for lack of resources. Join thousands of others who enable the WeMove community to run big and impactful campaigns like this one. Donate now. . Thank you for taking action to help the refugees left to freeze! Thank you for standing for migrants in Greece and Serbia with us. It is only together that we can truly be a force to be reckoned with.